Despite corporate-controlled mass Canadian media sources such as The Globe and Mail repeatedly telling Canadians that Canada is the only G-20 country not to have a national securities regulator, as if that’s supposed to make them feel bad, the Supreme Court of Canada unanimously decided that such a plan is unconstitutional, without the agreement of all provinces. So what if Canada is the only G20 country not to have a national securities regulator? A national securities regulator in the United States didn’t stop the 2008 financial crisis that was the most significant since the Great Depression. While a national securities regulator was unconstitutionally created in the United States in 1934 with the subsequent blessing of the United States Supreme Court, Canada’s Supreme Court stood for the Constitution, and for the better protection of the finances of Canadians with a decentralized financial regulatory system that is less susceptible to capture by corporations and more adaptive to positive change. 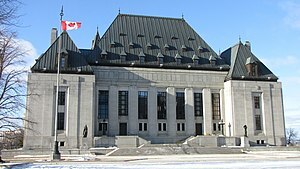 While the United States Supreme Court ruled 8-1 in 2011 that it was just fine for police to break down someone’s door without a warrant if they suspect evidence of drugs is being destroyed, an Ontario Superior Court judge ruled on February 13, 2012 that a three-year mandatory minimum sentence for possessing a loaded weapon amounted to “cruel and unusual punishment” in its application to a man who was holding one in the privacy of his own home, simply to show off the pictures to his friends on Facebook.